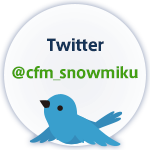 APPLICATION CLOSED For SNOW MIKU 2015 accommodation plan information, click HERE! APPLICATION CLOSED For ticket information, click HERE! ANIMATE Ltd. / BANDAI CO., LTD. / BANPRESTO CO.,LTD. / COSPA inc. / DAIHATSU MOTOR HOKKAIDO / DAIICHIKOSHO CO.,LTD. / ENSKY CO., LTD. / FamilyMart / FREEing CO.,LTD / FUJIMI MOKEI CO.,LTD / Gift Co.,Ltd. / GOOD SMILE COMPANY, INC / GungHo Online Entertainment, Inc. / HOBBY STOCK / Hokkaido Junbayu Honpo Inc / Ichijinsha Inc. / KADOKAWA CORPORATION / Katsuri Inc. / Kinki Nippon Tourist Co., Ltd / Kojitani Photo Studio.INC / MaxFactory / MOVIC CO.,LTD. / NAGATOYA Co.,Ltd. / NORBESA / Otto　Japan　Inc / PARACHUTE Co.,Ltd. / POKKA SAPPORO HOKKAIDO LTD. / SEGA Corporation / Sony Computer Entertainment / Sony Music Communications Inc. / Taito Corporation / TAKAHASHI co.,LTD / trivago / VOLKS .INC. / WASHIN OPTICAL CO.,LTD. / XVI Inc.